This is one of a group of reasonably large brown-spotted dorids found in the eastern Atlantic-Mediterranean region. Some of them have been apparently mistaken for the Indo-West Pacific species, Discodoris lilacina, also know as D. fragilis. They have been previously placed on the Forum as Discodoris cf. lilacina. Discodoris maculosa was first described from Naples and has since been reported infrequently from various parts of the Mediterranean. It is difficult to be sure of all records because there is still confusion surrounding the identity of these brown-spotted dorids. Probably the largest sample studied is that of Schmekel & Portmann (1982) who based their description on 36 specimens from the Naples region. 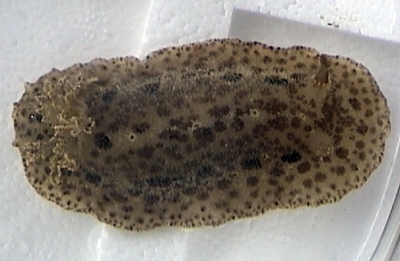 This species is a large brown dorid with a pale background colour and many, relatively small, roundish brown spots. There are often a few small dark brown, almost black spots, forming a line down the midline of the mantle between the gills and the rhinophores, and also around the mantle edge. These spots are usually surrounded by a whitish ring and can be clearly seen in the upper photo. Similar dark spots surrounded by white can be found in the Indo-West Pacific D. lilacina. Another characteristic external feature are the closely spaced soft, cone-shaped tubercles covering the mantle. As Ballesteros et al (1985) describe, this is quite different from the scattered tubercles of D. confusa. 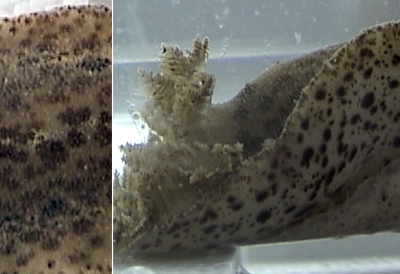 These authors consider Discodoris maculosa and D. confusa differ from D. lilacina in details of the reproductive system and radular morphology. Bergh, L. S. R. (1884) Malacologische Untersuchungen. In: C.G. Semper, Reisen im Archipel der Philippinen, Wissenschaftliche Resultate. Band 2, Heft 15: 647-754, Pls 69-76.